The Guild Secretary supplied a list of 24 men, with units but no further details. This transcription respects the view that all are equal in death. 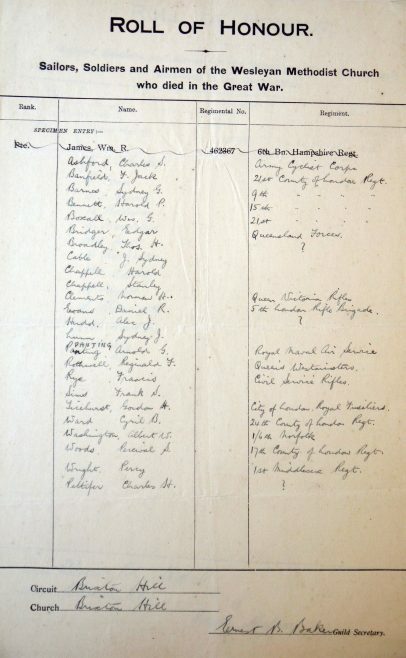 No other Methodist or local memorial has been located, but the records of the Commonwealth War Graves Commission include Brixton addresses for half the names, and all are recorded as casualties. Thomas H. Broadley illustrates the fact that conscious decisions were taken in the creation of these rolls. His mother appears to have been from Brixton, and presumably attended the chapel, but he was born and always lived in East Grinstead. J. Sydney Cable is recorded in the Historic Roll as having contributed from this chapel. F. Jack Banfield 21st Bn, County of London Regt. Sydney G. Barnes 9th Bn, County of London Regt. Harold P. Bennett 15th Bn, County of London Regt. William G. Boxall 21st Bn, County of London Regt. Cyril B. Ward 24th Bn, County of London Regt. Albert W. Washington 1/6th Bn. Norfolk Regt. Percival S. Woods 17th Bn, County of London Regt. Percy Wright 1st Bn, Middlesex Regt. Additional sources: Commonwealth War Graves Commission, 1901 and 1911 Census returns.